The cosmic microwave background, as seen by Europe's Planck satellite. Dark matter and dark energy may be weird and (as of now) inexplicable, but they do seem to exist. 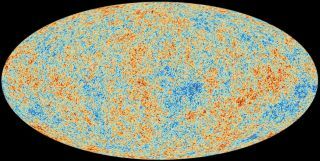 The final data release from Europe's Planck mission, which mapped the universe's oldest light in unprecedented detail from 2009 through 2013, reaffirms the "standard model of cosmology," European Space Agency (ESA) officials announced Tuesday (July 17). And dark matter and dark energy are key features of the standard model. Like two NASA space missions before it — the Cosmic Background Explorer and the Wilkinson Microwave Anisotropy Probe — Planck studied the cosmic microwave background (CMB). The CMB began streaming through the universe about 380,000 years after the Big Bang — long before the first stars began to shine. Tiny fluctuations observable in the CMB are evidence of seeds that grew into the cosmos' larger structure, so scrutinizing this light can reveal key insights about the universe's very early days. And this work has indeed been productive. For example, Planck's first data release, in March 2013, showed that the universe is 13.82 billion years old — about 100 million years older than previously thought. The observations also provided strong support for cosmic inflation, the idea that the universe expanded much faster than the speed of light in the first few tiny fractions of a second after the Big Bang. The 2013 release was based solely on Planck's measurements of CMB temperature, and used data from just the mission's first two (out of a total of eight) sky surveys. A second release, in 2015, combined temperature measurements with observations of CMB polarization — basically, a characterization of the light's oscillation — and featured all of Planck's data. The 2015 results were consistent with those of two years earlier, and extended them further into the big-picture cosmology realm. But the mission team stressed at the time that its cosmology results remained preliminary and in need of confirmation. “We felt the quality of some of the polarization data was not good enough to be used for cosmology," Tauber said. And the model they retrieved is the standard one, which holds (among other things) that the universe is composed of "normal" matter that we can see and touch; cold dark matter, which neither absorbs nor reflects light and therefore is impossible to detect directly; and dark energy, a mysterious force that seems to be driving the universe's accelerating expansion. Normal matter is by far the least abundant of the three, making up less than 5 percent of the universe's mass-energy budget. Measurements of the Hubble constant. But that number is far from definitive. In fact, it differs from the figure derived using observations of relatively nearby phenomena using NASA's Hubble Space Telescope and ESA's Gaia spacecraft — 73.5 km/s/Mpc. That difference may seem small, but it's significant, researchers said. "There is no single, satisfactory astrophysical solution that can explain the discrepancy," LFI deputy principal investigator Marco Bersanelli, of the University of Milan in Italy, said in the same statement. "So, perhaps there is some new physics to be found." "For the moment, we shouldn't get too excited about finding new physics; it could well be that the relatively small discrepancy can be explained by a combination of small errors and local effects," Tauber said. "But we need to keep improving our measurements and thinking about better ways to explain it."